There was a time in the late '80s when Thunder Blade machines were a fairly common sight in amusement arcades. Yet even with a decent amount of distribution it was never in the same league as its close cousins; the instant visual assault from Sega's flashier and more exciting looking games such as Out Run, After Burner and Space Harrier made Thunder Blade's slower pace seem decidedly tame in comparison (especially next to the extreme-speed dog fights of After Burner). Ultimately it never really took off, failing to capture the hearts of a generation. 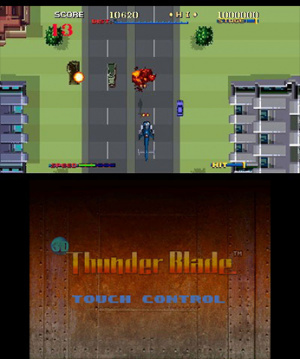 Various home versions were produced and while some captured the spirit fairly well, none managed to get close to the graphics of the arcade game. Thunder Blade was then left firmly in the archives, until developer M2 revitalised it as part of its Sega 3D classics range. Finally available in Europe, has M2 worked its usual magic and breathed new life into this oft-maligned classic in 3D Thunder Blade, or should it hover back into the depths? 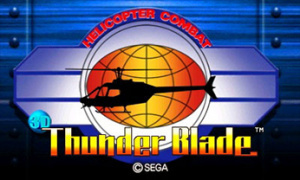 The premise of the game is standard fare - shoot down all the bad guys in your state-of-the-art helicopter gunship (which bears more than a passing resemblance to '80s movie/TV chopper Blue Thunder). You're blessed with an infinite supply of machine gun bullets and air-to-ground missiles with which to take out the array of enemy military vehicles lying in wait. Boring story setup aside, Thunder Blade is actually a pretty interesting proposition due to a unique gameplay mix. Each of the four stages is split into three parts - a top-down vertically scrolling shooter, followed by some flying into-the-screen (ala After Burner) and then finally a boss battle. All three sections merge together seamlessly; the in-game camera dynamically adjusts the viewpoint as required. It's this sporadic mix that gives Thunder Blade its unique charm. Being in control of a helicopter also enables some pretty cool gameplay elements. Throttle controls (which can be mapped to the C-stick of a New Nintendo 3DS or Circle Pad Pro) allow the player to adjust flight speed right down to a hover – although you're an easier target at slower speeds, it's simpler to avoid buildings and structures. M2 has kindly added a feature for players struggling with this aspect; the lowest difficulty setting removes death from scenery collisions, ensuring navigation of the more complex scenarios is much less frustrating. Additional control settings include two variations for the gryo/motion sensor to simulate being inside a moving arcade cabinet. Unfortunately imprecise movement combined with the annoyance of tilting and twisting the console is not a great experience. These options are best left alone in our opinion. 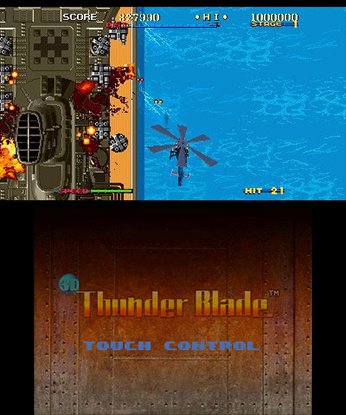 Graphically speaking, Thunder Blade has never looked better; the arcade game was technically superb back in the day, with clever use of sprite layering/scaling providing a fabulous sense of depth and immersion. Viewing these (still) impressive visuals in stereoscopic 3D adds even more depth, and with a solid 60fps (even with the 3D slider all the way up) it's hard not to be impressed when flying over the top of huge city blocks with the ground laid out far below. Together with the various screen settings (including widescreen and simulated in-cabinet views) the presentation of the Nintendo 3DS port is stunning. As beautiful as it undeniably is, the downside of Thunder Blade is the overall length. The entire game can be completed within ten minutes, but without the replay value provided by Out Run's route choices or After Burner's impressive twenty three stages (for example), Thunder Blade rapidly grows tiresome. This is not helped by some frustrating gameplay; often you'll die from crashing into an unseen enemy aircraft rather than being shot down, or burst into flames from running into scenery you're certain was avoided. It's fair to say the collision detection is a little dubious at times. The top down sections are basically bombing runs, which can be fun but fall short of being as good as a 'proper' vertical shooter; planning ahead to take out the ground based enemies before they can react isn't too difficult. It's a real shame, because a full-blown 2D shooter with these graphics could be incredible. Finally, the boss battles aren't really battles at all; they're simply flybys that are completed by staying alive rather than any destruction requirements (only the final boss has to be actually destroyed). To aid longevity, M2 added a Special Mode that's unlocked after clearing Arcade Mode once. Special mode tacks on an additional (newly designed) into-the-screen section followed by an extra boss battle at the end of the fourth stage; essentially about two to three minutes of extra gameplay. There are a few other tweaks such as enemy placement changes, weapon priority alterations and scoring system tweaks (plus your chopper is a different colour) but it's really just Thunder Blade 1.5 – a nice to have but nothing especially game changing. 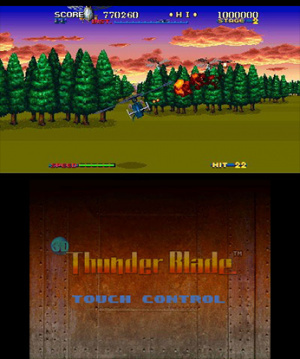 Typically Sega's sprite scaling games are synonymous with a fantastic soundtrack; it's all subjective of course, but Thunder Blade's soundtrack just isn't very exciting or memorable. It's an accomplished enough bass-y set of similar sounding tunes which do a job (and are by no means terrible) however the soundtrack as a whole just isn't as stand-out brilliant as other Sega classics. 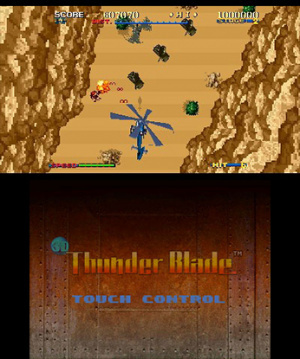 Coming to a suitable conclusion on 3D Thunder Blade is a difficult proposition; on one hand it's clearly the best of the 3D Classics on a technical level, but on the other hand the source material wasn't a particularly top-notch game to begin with. Beautiful graphics can't elevate average gameplay and the overall replay value is limited. There will be fans of the arcade original who will really love this conversion and if that person is you, it's everything you could ever want from a handheld Thunder Blade. For everyone else, treated as a quick pick-up-and-play blaster this has some value, but there are better choices available. Darn, I really wanted this to be good, but admittedly...I didn't realize this game was 10 minutes long. :/ If this was like, $2, I MIGHT have bought it, but $6 for ~15 minutes of gameplay?! i bought this game because I like old arcade games and i like the switching from behind to top down. It's quite a tricky game to master and as for most arcade games, finishing it is not the main goal but finishing it with a highscore is. I tried Super Thunder Blade on the Genesis collection on Steam. Honestly? It felt like a poor man's Star Fox. I remember the controls not being that great, and avoiding ANYTHING was a struggle. Sounds like the original isn't much better. @khululy it was a quarter eater for sure. @DarthNocturnal You cannot sensibly (Or fairly) compare Thunderblade to Super Thunderblade (In the same way you cannot compare Galaxy Force 2 on the Megadrive to the Arcade version). The whole point of these games is to replay them over and over in order to achieve the highest score possible (and to beat your high score). The length of the game doesn't matter for this genre. Loads of SHMUPs had only 5 or 6 levels. Points shouldn't have been taken off for that. Anyone that does so either wasn't around in the era of SHMUPs, or doesn't understand the genre. Sure, it's not as good as Out Run and After Burner II, but that doesn't make it -bad.- It's a technical powerhouse and the rail shooter portions of the game is really cool. Yes I kept crashing into everything at the start and yes, it was definitely frustrating, but I did much better later so it IS something you can adjust to and become a much better player. I was awful in After Burner II too a first. I'd recommend it to others. 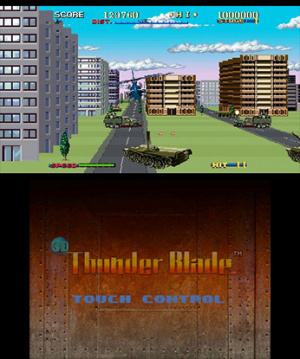 I have heard that Super Thunder Blade is very bad, like the Genesis version of Galaxy Force 2, and the arcade versions are vastly superior. Just to let you know, the controls in Thunder Blade are very good. @Donjwolf thanks for the feedback - as a 38 year old arcade kid (love traditional shmups) I get where your coming from. The score is based on Thunder Blade being an average game, not purely down to length. Although I would say the length of the stages is way too short, and you don't really need to learn much in order to be half decent at it. Great for a quick credit, not really a lasting experience for me personally. Glad you're enjoying it though, M2 did a great job of the conversion! Donjwolf already said what I think a lot of were thinking here as fans, and I agree with his sentiments wholeheartedly. Did you know a full run through one of Out Run's routes is only about 6 minutes including the small part at the end and when you input your initials (and yet I've logged...about 15 hours since I bought it on my 3DS, wow). Thunder Blade has closer to 10 minutes for a full run, but, no, there aren't branching paths like Out Run which admittedly was a great feature but not necessarily enough to say that Out Run is worth $6 and Thunder Blade is not. Content really isn't the issue at all, it's whether or not you can enjoy the basic gameplay as much to keep at getting those high scores. A lot of gamers could make the "mistake" of buying one of these arcade conversions, playing once or twice, and then complaining that they were ripped off for only getting 30 minutes. In truth, these classic titles can provide an endless amount of fun for those that care to play them with the perfect run in mind - which you'll never actually do but you may get close to it and surprise yourself. I bought this before the review but decided to see what NL thought of it and it's just as much fun as most of the arcade games that are part of these 3D classics releases, don't let this score make you think otherwise. Also, the gyro controls are a novelty that I actually really enjoy. While I don't care to play with the gimmick of having the moving cabinet in view, I do think that moving the 3DS to fly through these stages at full speed is a great experience (not necessarily for your best score runs, but for when you're just having fun). Out Run should have included the gryo option as well but sadly didn't. This game is a blast, check it out. 8.5/10 if you were curious how I'd score it, not that the score should matter much but this 6/10 here is not really consistent with giving Out Run a 9/10 (same reviewer too). This review is unprofessional if not downrigh LIE. I really want to see your 10 minute playtrough Jonathan Town. But not after you spent months perfectioning your skills. This version of the game also unlocks an special version with diferent layouts and new content that adds even more value to this port (so that would make 20 minutes, huh?). It also helps to have one of the BEST 3D effects avaliable on the system. @vonseux I realize you weren't referencing my post (and may not have read my post) but the 10 minutes is a decent estimate of a complete run, I think. I have a full run of Thunder Blade saved to a replay already (default difficulty, 3 star difficulty and 3 lives) and it's 9 minutes and maybe 20 seconds, IIRC. My full run of Out Run in my best replay (high score of 30,380,840) is only 6 minutes and 4 seconds. Of course, it took a few hours of practice to do that Thunder Blade full run (hours for Out Run as well) and I had to use a credit in the 4th stage so it wasn't a single credit clear (that 4th stage in Thunder Blade is like the trench run of the death star, lol). I've only seen just a small bit of the Special mode in this so far but it feels like a new game to me in a lot of ways and the entirely new section added to the game that was made exclusively for this release is a great reason to own this port. @dronesplitter yeah I've read your post. Like you said, it's a game to pour some hours on it. An arcade game (or any other) shouldnt be mesured by a trained or speed-run, because it takes hours to achieve that. Special mode it's also a great add-on. Just like Phantasy Zone 2's endless mode you can play that forever. All those new Sega 3D classics are excelent games totally Worth the price; it's even cheap if you put it side-to-side to other eshop games. But general public wouldnt pay much more for ports of old games, even if they feel entirely new when you play it. My final words; get it if you like fast, action packed, arcade games; it's very well made and fun! Reading the review again, though, these criticisms feel like they are just falling back on what gamers feel is the conventional wisdom regarding these arcade games and how they have been historically remembered more than giving it a fair shake. Why no mention of the boring story for Out Run? Or how the controls can be just as frustrating in Galaxy Force II? @DarthNocturnal Super Thunder Blade preceded Star Fox by several years, and the arcade game is even older. It's important to remember the context these games came from. It's not surprising that an almost 30 year old arcade game is no longer technically impressive. I think it's super fun to have these now, though, especially at the asking price and with all the extra 3d love thrown in. The closest thing to this and Afterburner was Blue Lightning on the Atari Lynx, which could actually do the scaling graphics nicely. Effects like those didn't come to home consoles until much later on the Super Nintendo, and we certainly never saw any Sega games on that machine! agree fully with the review, but my nostalgia remains strong. used to play this in the arcade in the cockpit and all. this was next to another station of afterburner II. 3D classic emulation done well once again! Im getting all of these 3D Classics that Sega/M2 are putting out as each one is the best version of the game its ever been and alot of care and attention has gone into them (cough cough unlike Nintendo releases) surely that's gotta be worth it. @vonseux Hi there - thanks for the comments. If you're really interested, I completed the game on my third try using the available credits, then a 1cc about an hour later. My biggest personal issue is the gameplay isn't that great, regardless of the beautiful graphics. Out Run has a wonderful learning curve and plenty of replay value in mastering the routes and learning how to react to the random nature of the other vehicles on the road. I love playing arcade games for mastery, but for me, Thunder Blades isn't worth as much effort because of the points raised in my review. It's a decent game, just not a great one - even when playing it in the context of a score based arcade game. Glad you're enjoying it though. 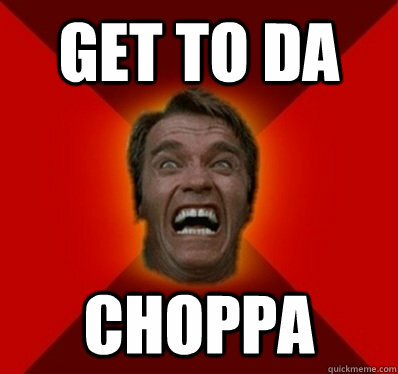 One, small, correction: it's "GET TO DA CHOPPA!" @dronesplitter I am heartened to hear that first-time players, in isolated cases (alas), are having as much fun w/ these games as those of us that played them first-run in the arcades did. @flojomojo we didn't even get them on SNES, actually, which couldn't scale individual sprites but, rather, only background layers (thus putting the Lynx above the base 16-bit consoles, at least in this one area)--not until the SEGA CD (or, if we're being pedantic*, the NeoGeo) did we get true sprite scaling and rotation effects a la arcade games. *Pedantic, because it was, of course, an arcade board in a console case. It's amusing/amazing what impressed us back then. People who say things like "mobile devices will never be able to play REAL GAMES like a console" forget how technology works. @ECMIM I'm loving these, they are wonderful games each and every one. Thunder Blade has actually got me hooked more than Galaxy Force II, probably because I don't have to worry about running out of energy during a run, hahah. Based on my short time with them, I can easily see how playing these in the arcade left an indelible impression on people, as well as the amount of praise they all get even now from fans is substantial. As you see. I did not attacked the score you gave for the game. But you really should edit out the phrase "The entire game can be completed within ten minutes". That's a very misleading statement. @Kirk Thanks, I appreciate that you found my comments to be of value here. I could have been a tad over zealous in how I stated my difference of opinion but no offense was intended, just a show of support where I felt many would be left feeling unsure of ever trying this great game. I think I would miss the great soundtrack on the Commodore 64 while playing this. I downloaded day one as want to support M2. They have done a fantastic job with all the 3D Sega classics thus far and cant wait for the next batch. Game is fun to play and SOO much better than the Megadrive version I used to play back in the day. Such an incredibly wrong score, it's disappointing. The game is at least an 8/10. I would get them all, no doubt! I personally agree with the review. I put a couple hours into it when it was released on the eShop and didn't really enjoy it then and have given it another shot on the Sega 3D Classics Collection and I still feel it's simply not that fun to play. I feel the gameplay is frustrating as you helicopter is always blocking the view, it's the same with After Burner but that gets away with it through having clear visuals and making up for it in other areas (like the thrill of it all!). Here, I feel like I'm having to just speed through as quickly as possible, simply moving around the screen and hoping for the best. It's nice to go back to for 5 mins every now and then but when all is said and done I'd much rather be playing almost any other M2 3D Classics game; Super Hang-On and Fantasy Zone II W being personal favourites.